As digital campaigns mature and evolve, new opportunities arise to improve both efficiency and returns. In fact, I see a big opportunity on the horizon for our clients’ digital strategies; connecting email nurtures and media campaigns together. Media campaigns put a bunch of unknown prospects in the top, turn some of them into known contacts, and then marketing automation platforms like Marketo and Eloqua nurture them via email through to a certain lead score or to Marketing Qualified Lead (MQL) status. Many clients then implement remarketing strategies within media campaigns, taking what we know from our initial engagement and building audiences that refine their targeting. These all feel like and in fact are, smart ways to leverage audiences to improve campaign performance. But, my thinking for 2018 is how can we connect these pieces together more seamlessly to deliver an even better experience, and as a result, improve the performance of both email nurtures and media campaigns? The answer is simple – we need to view both channels as ways of simultaneously working with audiences. 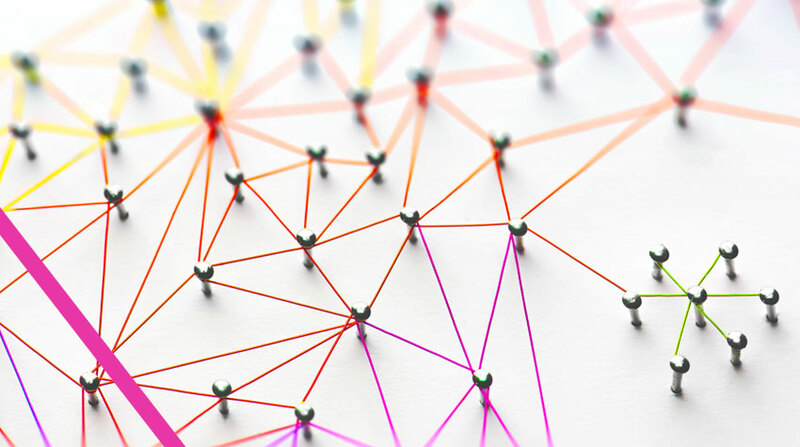 It seems like an easy shift in thinking, and it is, but it’s the operational implications for many enterprise clients and the need to connect the two distinct functions that hinders implementation. Let’s take a simple ‘Discover, Consider, Decide’ nurture across two countries; US and UK. We have a number of contacts at each stage for both and we’re engaging them via email nurtures until their lead scores reach a target level and they can be progressed through the nurture. Sounds familiar, right? Then we have our media agency running campaigns for us, driving prospects to landing pages in the hope they convert to known contacts and enter our email nurtures at the Discover stage. Likely to also sound familiar. What’s the value of each of those prospects we engage via media though? How are we managing the contacts that have already converted to a known state? But, instead of the above options, what would happen if we linked our media campaigns into our email nurtures? We have our ‘Discover’ audience that we’re filling up via media campaigns, great. But, they’ve already engaged, so how are you changing your messaging via email? What are you doing to nurture them from ‘Discover’ to ‘Consider’? How does that messaging differ to the cold prospecting message being served via your media campaigns? Here’s our first opportunity; extract the ‘Discover’ audience from MAP, exclude that audience from your prospecting media campaigns and then, build out a set of media campaigns that deliver a refined ‘Discover’ message’ that better fits the stage they are at in their journey. 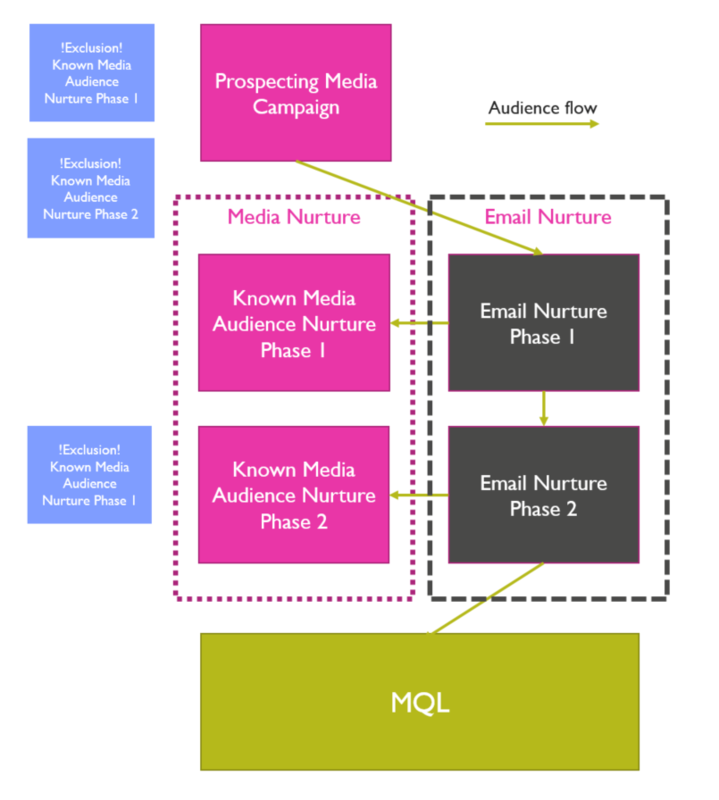 Repeat this cycle for your ‘Consider’ and ‘Decide’ audiences, and you my friend, have a connected approach to media and email nurtures that accelerates your audiences through to MQL via all available channels. There are other benefits too; with these new segmented media campaigns, targeted to audiences at different stages of the buyer journey, you can allocate budget more effectively. Rather than just one giant pool of media that places the same value on exposure to a cold prospect as it does a warm prospect at the final ‘Decide’ stage of your nurture, you have individual audiences that you can individually proportion budget for, ensuring maximum reach for your highest value audiences. Sweet, sweet media efficiency. One final nod to our two countries (US and UK) – I’m sure you wondered why this was specified earlier. A critical element of transposing your audience from MAP to media platforms successfully is the size of your audience. How you segment your email nurtures and then how they might be effectively recombined to reach the necessary scale of audience required is something you absolutely want to think about up front. Convinced? Ready to get moving on this? Contact us today and keep an eye out for our guide to ‘Connecting Media and Email Nurtures for Greater ROI’.